Benjamin Usha created this map in Geo 343: Remote Sensing II. The Indiana Dunes occupy a 15-mile stretch of land located on the southern tip of Lake Michigan. Trails in the dunes play an important role in providing recreation for visitors and they have expanded over the years. One such trail is located in the Cowles Bog area located on the western end of the dunes. 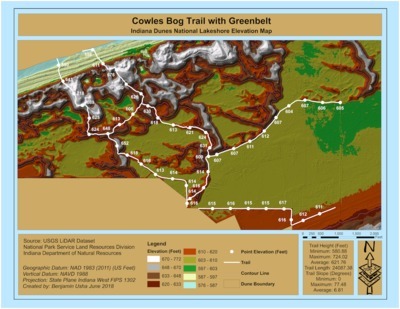 An elevation map of the trail was created using USGS Light Detection and Ranging (LiDAR) data from the dunes. Points, spread out every 500 feet, represent elevation information. The trail is set against a 3D representation of the elevation of the dunes. Summary statistics of the trail help users better understand the properties of the entire trail. The map can be used by hikers to see how high they are at certain points and to plan their trip accordingly.